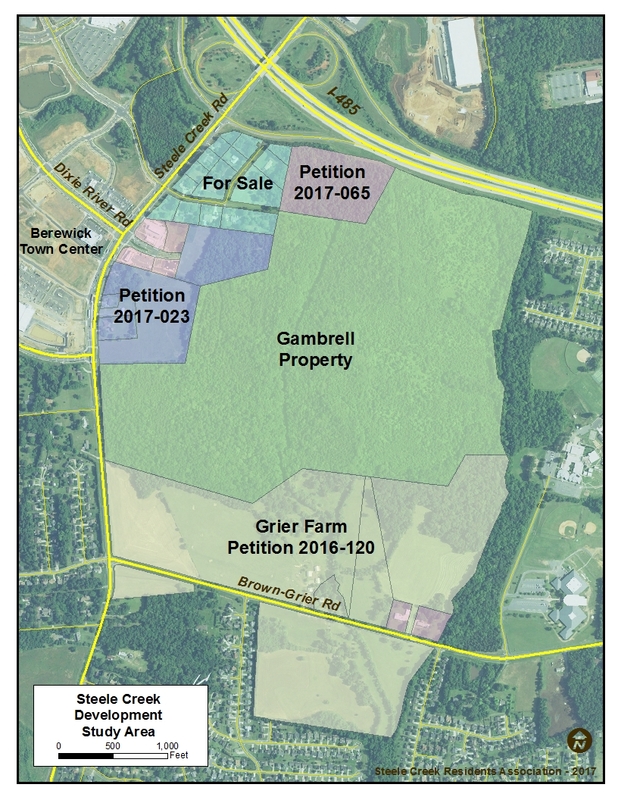 The property (including five separate parcels) is located east and south of the BP gas station and Bojangles restaurant on Steele Creek Road across from the Berewick Town Center. (See map below.) The petition requests a change from R-3 (residential with up to 3 units per acre) to MUDD-O (mixed use development district - optional provisions). The site plan calls for up to 85,000 square feet retail (including a Lidl grocery store), up to 105 hotel units, and up to 250 residential units. Lidl is a German grocery chain that is described as "upscale discount." (See Here's what Charlotte's newest grocery store chain will look like - Charlotte Observer, June 15, 2017.) The Lidl store would be adjacent to the Bojangles on Steele Creek Road. The Charlotte-Mecklenburg Planning Department has been working on a development study for the area generally bounded by I-485, western property lines for Williams Glenn subdivision and the schools, Brown-Grier Road, and Steele Creek Road. In addition to Petition 2017-023, there are two outstanding rezoning petitions in the study area: Rezoning Petition 2016-120 and Rezoning Petition 2017-065. Community meetings on those petitions will be scheduled at a later date. See Wrap-Up Presentation for the Steele Creek Development Study Released. A final report on the study is expected within the next few weeks. 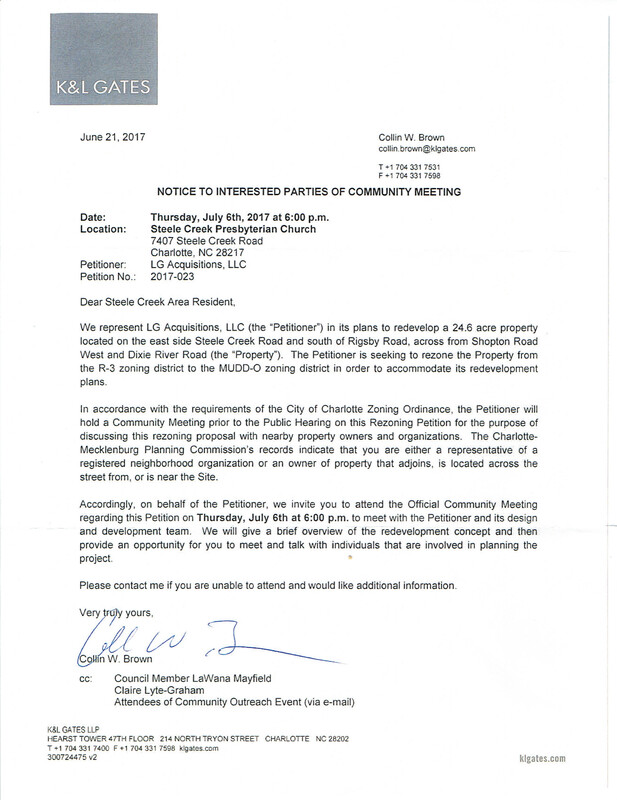 The Steele Creek Area Plan, adopted in February 2012, calls for residential development with up to 6 dwelling units per acre, but consideration will be given to a mixture of residential, office, and retail land uses, with retail being limited to a convenience size center (70,000 square feet maximum). The wants and needs of the community. This community meeting is the next opportunity for area residents to provide feedback to the developers, city staff, and elected officials on what the community desires in this area. You are encouraged to take advantage of this opportunity to have your voice heard.